Frequent visitors to this blog are surely tired of my ranting on and on about how no one reads great books anymore. Hell, I’m tired of hearing myself complain about it. But I cannot resist. A First Things ‘On the Square’ article about it being ‘hard times’ for great books here. My complaints are not gripes, for it is not a trivial matter. The way in which members of a civilized society spend their leisure time is almost all-important to the ongoing welfare (not to mention possible flourishing) of their culture and society. For those that have not read it, I cannot recommend Josef Pieper’s book ‘Leisure, The Basis of Culture’ highly enough. Please, for your own sake and for the sake of our civilized society – turn off the tv, put away the ipod and the game station and read Chaucer, Homer, Dante, Shakespeare, Plato, … great books! This entry was posted in Uncategorized on September 30, 2008 by Kleiner. Chaucer? I thought he was the winner on American Idol season 4? LOL, ok lame joke! Anyway, would it be possible for the philosophy department to completely overhaul the way things are currently structured to do what St. John’s College calls The Great Book Program? Obviously, since the university already has its own requirements set for math, english, etc it may not work as effectively as St. John’s, but would it be possible to do it on a smaller scale? Or, would it be possible to talk the University Administration into allowing the Philosophy Department to outline entire programs for students that will get them into the right classes to read Dante, Homer, Shakespeare, etc? So utilize the programs already taught in History, English, Math, Science, to steer students into these great writers, philosophers, scientists, etc. Dr. Huenemann, I know you know about the program, is it possible to do something like that, even if it is on a much smaller scale? It would be great to have a little more uniformity in philosophy to encourage coversations amoung philosophy students. That way Freshman take the same courses, Sophmores can assist the Freshman and also discuss with other Sophmores, etc. I hate to say it, but there might be only 2 or 3 students enrolled in such a program. I’d love to be a part of it, but my sense is there just isn’t enough appetite for it on the part of the students. Students, please correct me if I’m wrong! That seems extraordinarly sad to me! If I were not such a poor man I would have loved the experience at St. John’s. The problem with most educational institutions (I believe) is that most students take completely different classloads (I understand for science majors, but not for humanities) then everyone else. The only people reading or writing about what you are studying are the people in your class. When students have similar classes campus wide, this can spark discussions and random study groups all over. It would be neat to see the philosophy department do that on a small scale, but it would be extraordinarly challenging and maybe most students wouldnt like that these days…. I’m not sure about everyone else but if I could have signed up for a “classics” approach to my gen-ed requirements when I started USU as a pre-CS emphasis that might have cured me from having to change my major to keep from being bored out of my mind. Starting such a program at USU would be difficult, nuanced work. Being an employee all over campus what was obvious is that change is not easy at USU. What might be nice is to just have an idea of which classes would cover that material, like Doug said. Map out a “classics route” that incoming freshmen can take a look at. There are those in that mindset before they head off to college. I imagine there were more when Dead Poet’s Society was a more recent movie. Perhaps a survey of incoming freshman would be in order maybe you can throw something into freshmen “survival kits”. For me I became much more disillusioned after I got to college and saw everyone there just looking to get in, get out and get that piece of paper (and a system that supported that way of thinking). I was expecting, as a CS student, to be introduced to the classics. One of the reasons I switched was to try and get that because I didn’t think I could get it otherwise. I could have done both but that would have been a pain and I was working the whole time. In any case, my point is: students may be interested in a classical education until they are implicitly taught that it’s an unrealistic expectation. Disclaimer: I am young and naive. In time I will have the appropriately cynical attitude. I think there is more interest in this than Huenemann suspects. I don’t hear this from lots of students, but certainly some speak of how impoverished they feel in their education. And I sometimes have students ask me, ‘How did you get like that?’ (not referring to how I got to be so ugly and annoying, but how did I get to the point where I have some small bit of an ability to read and think in deep ways). In other words, I think students want a real education, they just have no idea what it is, what it would look like, and how to get it. This is as it should be – they are students. What it suggests is that the college is really failing them. But, even if there isn’t any student interest, I still think we should offer it. Students don’t know what they should learn, that is why they are students. It is the job of the faculty to develop curriculum that is actually good for the student (and this may be and probably is different than what most students would want). For my part, I am daily grieved by the death of real education in this country. Plenty of ink has been spilled in the funeral mass for higher education (The Closing of the American Mind, The End of Education, etc etc etc). I hope I never lose the perhaps naive idealism of insisting that college not turn into vocational training school. I am totally committed to a liberal arts education, and am totally committed to trying to bring that about at USU (even if that will end up being in vain). Doug has really nailed something, but his point extends beyond the college environment. Having not read the same books, having not had a common education in the liberal arts and great books, it is impossible for students to converse. But, after college, it produces a society whose members are, for lack of a better term, culturally retarded. No one should be able to graduate college without having read Plato or Shakespeare or etc etc. (Of course, we’d have to fight over the list of must reads, and I would end up being called ‘eurocentric’ and ‘phallocentric’ and ‘logocentric’). If you let students enter society without a liberal arts background, you are imperiling their very ability to be happy. And from a social point of view, you are frustrating their ability to speak and think about political and social goods (the good, the beautiful). I do not think it is too much to say that, in so doing, you are imperiling our democratic civilization. 1) Perhaps students and profs could post courses they have taken (English, Philosophy, History, whatever) where you read great books. That way we could start to develop an informal list to show students who are interested in a real education. 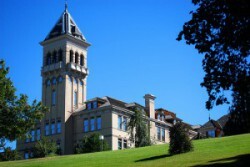 2) At a school like USU, students will have to take most of the responsibility. They’ll have to read on their own, find small niche communities of like-minded persons, etc. The Philosophy Club could certainly morph into something like that. 3) I doubt this will ever happen, but I think the USU 1320 course (that university course all students must take) should be standardized. Everyone should do what Huenemann did the last time he taught it (a mini crash course in the great books and great ideas). 4) Faculty members who are convinced of the goodness of a liberal arts / great books education should be more active in trying to bring such a thing about (even if just in the form of a pilot program or perhaps some kind of new interdisciplinary minor or major). It will be hard slogging, likely in vain, But “all fine things are difficult” (Plato). I do think we should try to do this on a small scale in the philosophy department (actually, I think you can say that we are already doing this on a small scale in the philosophy department, though perhaps we could do more). 5) Get active in a ‘political’ sense. Everyone (politicians, university leaders, etc) agrees that it is imperative for our students to learn the basic skills of reading, writing (communication), and critical thinking. But are the colleges and departments that actually teach those skills being supported? Write your legislators. Write the Regents. Write to the USU President. Ask them what concrete (read fiscal) support they are providing to those colleges and departments who are on the front lines of developing these universally agreed upon skills of reading, writing, and critical thinking. I completely agree with you Mike. When I first came to college, I expected great coversations, articulate debates, and the occasional good party. My vision of college was WAY off!!! However, there were professors that encouraged that type of atmosphere (Dr. H being one of them-especially during the summers). I just think that a program that maps out generals and other classes for students, that also gives them access to all the classics would be fantastic! What about adding a class or two (not sure teaching rules, or who has time) that focuses on two to five great books a semester? The type of class that can be repeated for credit, and that all liberal arts majors can take every semester if they so choose. It seems possible that the department heads of each department and the Dean could get together and work out a required class or two out of it. This would begin (at least) an introduction to the “classics” that many people never get to read at USU. I feel sad for Doug and Mike, given their accounts of their disappointing experience (as a whole, exceptions like Huenemann’s courses duly noted). Though they are both evidence that one can, through hard work and taking responsibility for oneself, make up for the shortcomings and become educated on one’s own. Can such a curriculum (even it is is ‘local’) and environment be brought about here? It is possible. But change is difficult, and the grant money tends to flow in other directions. I think large universities need to decide if they are going to value the humanities as a core and central part of being an educated person, or if the humanities will just be ‘finishing school’ for business and engineering majors. How many college professors does it take to change a light bulb? Huenemann – is there a list of course descriptions (including what they read) for all the departments in HASS? I would think that, if we had such a thing in a booklet or something, we could pour through it in an afternoon and highlight the courses (however many there are) that are ‘great books courses’. I’m a student in the philosophy and economics department here at USU–and I can’t agree more with this idea. My freshman year I actually spent at the University of Chicago; due to different circumstances, I was forced to transfer here to finish off my schooling–not that I regret it, but I mention it as a grounds for comparison. While the University of Chicago didn’t operate under St. John’s Great Books program, all majors were still required, as part of the Core Curriculum, to take different specialized courses in humanities and social sciences. These courses were primarily based on reading primary sources. One course, for example, called Power, Identity, and Resistance, had us read Adam Smith’s Wealth of Nations and Theory on Moral Sentiments–works that I would assume with almost 100% certainty none of my Economics Major colleagues have read, despite being the foundations for contemporary free trade economics. Moreover, we all took courses that would have us read Plato’s dialogues and the Republic, Homer’s Illiad, Aristotle, Descartes, Hume, Montaigne, Hobbes, etc. For example, while I understand its a course with a broad scope, I find it sad that in the Ancient Greek Philosophy course I’m taking, we have read a little textbook giving us a particular interpretation and synopsis of pre-Socratic thought. We are provided a secondary textbook with excerpts of those Philosopher’s writings, but it is not emphasized as much as the tertiary source we use. I suppose though, as it stands here, one can make an effort and take extra courses not required by a major and milk the university for the education one desires which isn’t required, just takes extra effort on the student’s part. That’s my anecdote–just wanted to give a student perspective. Yes, Charlie (and Emil Kramer for the short time he was there) was the huge exception for me as well. I imagine there are other good profs on campus; I just don’t know who they are. Lots of people liked Norm Jones. I imagine it still can’t be the same as small liberal arts colleges. I have a few friends who went to Wheaton in Illinois (a private Christian college). They had great experiences there but that school is pretty picky about who it accepts and everyone there is pretty much on the same page about how the core curriculum will play out. Whatever you try to do at USU would have to be some sort of hybrid that recognizes the quite different identity of the average student. I’ve met a lot of Wheaton grads and seem to get along with them pretty well (maybe that should be a mark against their approach). Mike is right, all we could hope to generate at USU would be a ‘hybrid’ program. I am not deluded, USU is not a small liberal arts college and it never will be. I would like to explore putting together a list of courses that are already offered at USU. I would think that, with a mix of courses in philosophy, history, politic science, english, and the classics minor, one could put together a pretty nice liberal arts curriculum. I don’t mean to sound discouraging. This sounds like a good start. I’d like to think something can be done.